"It can know time of day, it can know weather. We can also have it understand what our service times are so it only suggests items that are easier to make in our peak hours," said McDonald's chief executive Steve Easterbrook. The ultimate aim was to provide a "much more personalised experience" and to be able to suggest additional items based on the customer's initial order, he added. 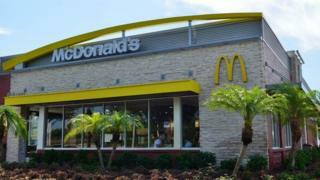 Mr Easterbrook said McDonald's would use the technology to make the most of data gathered from serving the firm's 68 million fast-food customers and that it would be integrated into the app and the self-order kiosks already in stores.